Are ants constantly having a reunion in your caravan? But before slapping them with your slippers or putting out your insecticide, note that most pests from ants to spiders are scientifically proven to be necessary to keep ecological balance. First thing to remember is to act on it quickly. The more you delay clearing pest infestations in a caravan, the greater the risk of your family getting an infection. Plus, long-term neglect of pests and rodents can damage your rig permanently. 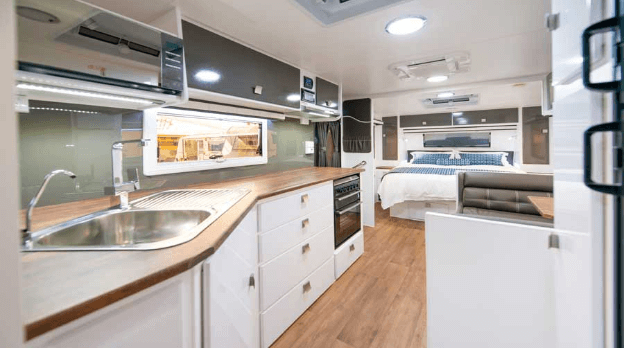 Given that millions of dollars are spent each year in repairing pest related damages according to caravan insurance claims, it’s best to know the signs pests are living alongside you in your caravan. 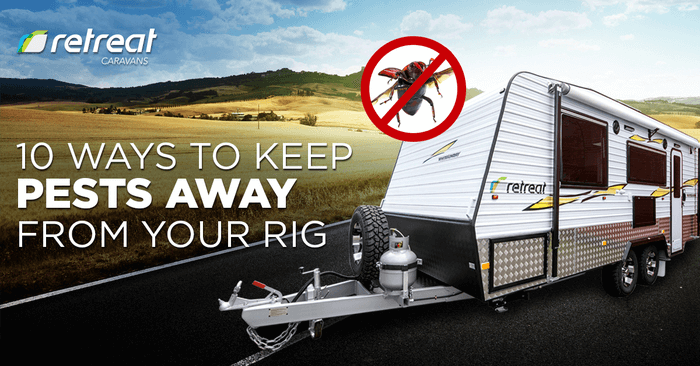 As you explore new territories with your caravan with bunks, you have a diverse types of pest threats that can get into your rig. You can have snakes, maggots, cockroaches and rats among others. The problem is that pests are attracted to caravans. Bugs for instance, seek shady and cool places to hibernate during the summer. When the heat increases outside especially during summer, ants multiply as well. Not only are ants a nuisance to your caravan, but also the health of the caravanners. Ants are almost impossible to eradicate and hence, prevention is the best cure. Vermin damages include damage to cords, wirings and plastic containers in addition to health risks. Seemingly little, mice enter caravans for food and shelter mostly during the winter season. Not only do they carry lethal diseases, but they also increase the chances of fire hazards due to circuit breaks. A dominant pest in most unclean caravans, cockroaches are a sign of poor caravan cleaning. We hihgly recommend to follow this guide how to keep your rig clean to living smartly. Cockroaches are renowned for carrying allergies and infections as most roaches tour the garbage prior to entering your rig. Dark corners are often privy to deadly spiders and cobwebs. So that they would not be attracted to stay, regularly clean dark areas as well as cardboards. If the spider pestilence is too much, remove wooden boxes and replace it with plastic. Yet another pest that loves wood, wasps make nests out of wood pulp. Wasps build nests in shady areas with one entry point facing the light. They are likely to be found in the ceiling, wall space and cardboard boxes. During the wet season, the most annoying bugs that visit caravans are maggots and snails. They are especially common during this time, as food rots faster. Also check your furniture and implements that are made of wood. Wood is food for snails and slugs. Moreover, be wary of snails that carry lungworm, which is known to be fatal for caravanners when parked near wet areas. A perennial problem by most caravanners, flies are known to hibernate in the roof as well as shady corners and shelves in a caravan. Entering via the vents, flies are considered a serious threat during winter and autumn. After hibernation, cluster flies appear when the season changes. Often, pest infestations happen when owners don’t take care of their caravans. And extra care must be done during the change of seasons to ensure freedom from pests. Your best move for this is to uproot the main cause of infestation. This stops the problem immediately and prevent any chance of re-occurrence. But it is still best to just prevent it altogether. Here is a look at the causes of infestation and situations that make your rig vulnerable. The biggest cause of pestilence is spilled food and oil. When neglected, these tend to attract ants and flies. Then, the food rots, attracting maggots, worms or bugs. Therefore you must immediately clear water and food leaks spillage with potent cleansing liquids. Also remember to keep your trashcan sealed at all times and clean dishes immediately after meals or throw away disposable utensils after use. In addition to food waste, a water leak also aggravates pestilence. If you notice ants or vermin, trace their route and identify dampness in walls, ceilings and floor of the caravan. Drying damp areas also prevent snails and maggots to come and stay . Be conscious of open vents. Many holes in a caravan need to be open for the proper functioning of the rig. But these openings also serve as entry points for ants, snail and mice. Thus, as much as possible, close these vents. But do not close gas vents. Doing so can lead to condensation damage. Always pay attention on the spot you park your caravan. Park away from vulnerable areas such as ant hills, swamps and garbage to avoid easy or accidental entry of rodents and vermin. In addition, cross-check with your caravan park manager to ensure that you do the area-specific precautions against pestilence too. Another major cause of caravan plagues is the careless storage of caravans in winters. Make sure to remove paper, food, containers and upholstery prior to storage, as bugs tend to make shelter in such spaces. In addition, clean the van if you’re planning to store it for at least a month. In addition to the blend of natural hacks and regular cleanliness, there are many and efficient ways to keep pests off a caravan. Note that pests most likely show up during rains and summers. These are simple but effective hacks to keep pests away from your caravan. To keep your caravan hygienic, clean it thoroughly every three months. Moreover, do a spring-cleaning before storing your caravan during winter. If you observe a trail of ants, clean it immediately as ants tend to secrete pheromones that direct other ants towards the presence of food. If you have kids or pets, spray cleaning might seem hazardous. However, for stubborn pests, you may have no choice but to spray some pesticide. In such cases, spray the poison indoors before you leave the caravan during sightseeing in the morning. The caravan will be 100% free of bugs and vermin when you get back in the evening! When on the move, it is natural for food containers to topple and tumble over each other. To prevent food spills and subsequent pest infestation, use securable bungee cords with suction to keep the food in the fridge intact. Moreover, you can also use veteran storage hacks to prevent pantry food from spilling when on the move. One of the best solutions to prevent widespread damage due to pests in a caravan is by using a common kitchen spice- cinnamon. Cinnamon sticks emit bug repelling intense smell. It is powerful against lizards, mosquitoes, ants and flies. Sprinkling cinnamon powder along the sills of your window and vents will prevent the entry of bugs. You can also add cinnamon powder to the litter box of your pet or tie it around your candle holder to keep bugs away. Regularly using a dehumidifier in your rig prevents damps. Water leaks and spills during the wet season aggravate dampness within a closed space in a caravan more than a house. Considered a hotspot for pests, dehumidifier not only removes mould, but also keeps the temperature even, preventing the growth of pests. Best to use during the warm and wet months, a dehumidifier is a necessity for caravanners who experience constant threats of pest infestations. A cheap and economical way of disposing of rampant pests such as ants and mice, sprinkling talcum powder around your caravan helps to clean bugs quickly. Talcum powder helps to cut breathable air for the bugs and hence, suffocates the pest until death. If the pestilence is widespread in your van, you might have to repeat the procedure a handful of times to make an effect. Yet another excellent powder used to get rid of ants, cockroach and moths is baby powder. Additionally, ensure that you do not sleep in the same place as the application of the powder too. Consider the best and the most traditional way of eliminating ants, adding borax to honey makes the best Rodent and Insect killer. For extreme cases of Ant invasion in your caravan the borax mixture will work effectively. Borax is the key bug killer element while the sugar is used to lure ants to the trap. The chemical helps to kill ants and flies including their larvae as they pick it up and distribute the food to the entire ant populous. Mixing borax powder in a sugar solution also helps to spread it over vertical surfaces too. Considered nature’s remedy, pets at the higher end of the food chain can effectively eat rodents and flies to keep your caravan pest-free. Using a cat can significantly help in reducing the number of rats and cockroaches while a lizard eats up most of the insects. Keeping a dog on the other hand is beneficial for eradicating vermin as well as busting your stress during the journey. Popular as poisonous sand, bombs and chalks, there are many options for 100% efficacy of pest solutions for caravanners. When using readymade poisons, one must take care to follow the precautions without flaw, to avoid hazardous situations. Ensure that the poisonous materials are within the reach of pests, yet out of reach from children and your routines. Additionally, you must follow the complete course of such readymade poisons to reap the maximum effect. There are many traps such as mouse traps and spider traps available for the quick extermination of pests from a caravan too. Despite the availability of modern and cutting edge pest removal solutions, the best insect repellents are available directly in nature. If you suffer from endless flies and mosquitoes wherever you take the rig, you need to try burning essential oils. Burning sage in the evenings is excellent to clean bugs off your rig while smearing essential oils such as peppermint effectively keeps the pests away. Strong essential oils radiate concentrated smells that not only drowses insects and rodents, but also kills them. Completely closing all the vents in a caravan causes condensation damage. For this, the best solution is to seal the impossible-to-close caravan vents with fine meshes. This prevents the entry of pests, especially mosquitoes during twilight. You can also spray bug repellents on these meshes. In addition, ensure that your rig has no cracks. If you notice any, use caravan-specific seals to close it as well. While regular vacuuming kills bed bugs, periodic cleaning erases the risk of infestations. Keep a shelf loaded with pest repellents especially during the vulnerable months. 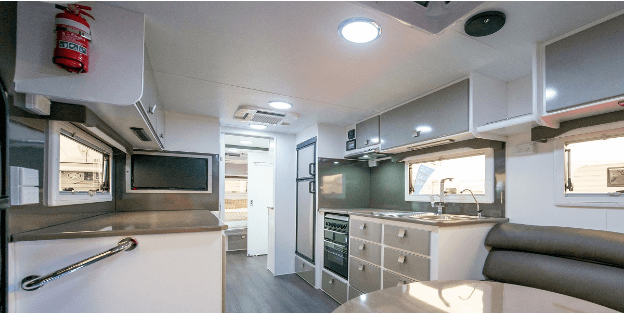 It is common for caravanners to hyperventilate at the sight of pests such as the army of ants or deadly spiders or even the yucky snails because as much as they are harmful to health, they also damage the caravan. Most of us burn every last one in the ant army, but the sensible thing to do is to prevent pest infestations in the first place! Check Retreat new caravans for sale here.